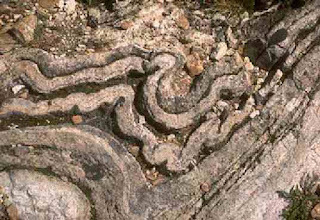 A wave-like geologic structure that forms when rocks deform by bending instead of breaking under compressional stress. Anticlines are arch-shaped folds in which rock layers are upwardly convex. The oldest rock layers form the core of the fold, and outward from the core progressively younger rocks occur. A syncline is the opposite type of fold, having downwardly convex layers with young rocks in the core. Folds typically occur in anticline-syncline pairs. The hinge is the point of maximum curvature in a fold. The limbs occur on either side of the fold hinge. The imaginary surface bisecting the limbs of the fold is called the axial surface. The axial surface is called the axial plane in cases where the fold is symmetrical and the lines containing the points of maximum curvature of the folded layers, or hinge lines, are coplanar. Concentric folding preserves the thickness of each bed as measured perpendicular to original bedding. Similar folds have the same wave shape, but bed thickness changes throughout each layer, with thicker hinges and thinner limbs. Folds form under varied conditions of stress, hydrostatic pressure, pore pressure, and temperature gradient, as evidenced by their presence in soft sediments, the full spectrum of metamorphic rocks, and even as primary flow structures in some igneous rocks. A set of folds distributed on a regional scale constitutes a fold belt, a common feature of orogenic zones. Folds are commonly formed by shortening of existing layers, but may also be formed as a result of displacement on a non-planar fault (fault bend fold), at the tip of a propagating fault (fault propagation fold), by differential compaction or due to the effects of a high-level igneous intrusion e.g. above a laccolith. The tighness of folds can be described as open (limbs dip gently), tight (limbs dip steeply) or isoclinal (limbs are parallel). The orientation of the axial plane relative to the horizontal together with the orientation of fold limbs allow subdivision into upright (axial plane vertical, limbs symmetric), overturned (axial plane moderately inclined, one limb overturned), or recumbent (axial plane near horizontal, one limb inverted). Thickly-bedded, brittle units tend to form concentric folds with the bed thickness preserved normal to bedding surfaces. Thinly-bedded, clay-rich units have a tendency to develop a foliation parallel to the axial plane and form similar folds with the vertical distance between top and bottom of the unit preserved through the deformation. In structural geology, an anticline is a type of fold that is an arch-like shape and has its oldest beds at its core. A typical anticline is convex up in which the hinge or crest is the location where the curvature is greatest, and the limbs are the sides of the fold that dip away from the hinge. Anticlines can be recognized and differentiated from antiforms by a sequence of rock layers that become progressively older toward the center of the fold. Therefore, if age relationships between various rock strata are unknown, the term antiform should be used. The progressing age of the rock strata towards the core and uplifted center, are the trademark indications for evidence of Anticlines on a geologic map. These formations occur because Anticlinal ridges typically develop above thrust faults during crustal deformations. The uplifted core of the fold causes compression of strata that preferentially erodes to a deeper stratigraphic level relative to the topographically lower flanks. Motion along the fault including both shortening and extension of tectonic plates, usually also deforms strata near the fault. This can result in an asymmetrical or overturned fold. An Antiform can be used to describe any fold that is convex up. It is the relative ages of the rock strata that separate anticlines from antiforms. The hinge of an anticline refers to the location where the curvature is greatest, also called the crest. The hinge is also the highest point on a stratum along the top of the fold. The culmination also refers to the highest point along any geologic structure. The limbs are the sides of the fold that display less curvature. The inflection point is the area on the limbs where the curvature changes direction. The axial surface is an imaginary plane connecting the hinge of each layer of rock stratum through the cross sectional anticline. If the axial surface is vertical and the angles on each side of the fold are equivalent, then the anticline is symmetrical. If the axial plane is tilted or offset then the anticline is asymmetrical. An anticline that is cylindrical has a well-defined axial surface, whereas non-cylindrical anticlines are too complex to have a single axial plane. Anticlines are usually developed above thrust faults, so any small compression and motion within the inner crust can have large effects on the upper rock stratum. Stresses developed during mountain building or during other tectonic processes can similarly warp or bend bedding and foliation (or other planar features). The more the underlying fault is tectonically uplifted, the more the strata will be deformed and must adapt to new shapes. The shape formed will also be very dependent on the properties and cohesion of the different types of rock within each layer. Recommended For You How Do Opalised Fossils Form? During the formation of flexural-slip folds, the different rock layers form parallel-slip folds to accommodate for buckling. A good way to visualize how the multiple layers are manipulated, is to bend a deck of cards and to imagine each card as a layer of rock stratum. The amount of slip on each side of the anticline increases from the hinge to the inflection point. A dome is a feature in structural geology consisting of symmetrical anticlines that intersect each other at their respective apices. Intact, domes are distinct, rounded, spherical-to-ellipsoidal-shaped protrusions on the Earth’s surface. However, a transect parallel to Earth’s surface of a dome features concentric rings of strata. Consequently, if the top of a dome has been eroded flat, the resulting structure in plan view appears as a bullseye, with the youngest rock layers at the outside, and each ring growing progressively older moving inwards. These strata would have been horizontal at the time of deposition, then later deformed by the uplift associated with dome formation. A structural basin is a large-scale structural formation of rock strata formed by tectonic warping of previously flat lying strata. Structural basins are geological depressions, and are the inverse of domes. Some elongated structural basins are also known as synclines. Structural basins may also be sedimentary basins, which are aggregations of sediment that filled up a depression or accumulated in an area; however, many structural basins were formed by tectonic events long after the sedimentary layers were deposited. Basins appear on a geologic map as roughly circular or elliptical, with concentric layers. Because the strata dip toward the center, the exposed strata in a basin are progressively younger from outside-in, with the youngest rocks in the center. Basins are often large in areal extent, often hundreds of kilometers across. A monocline (or, rarely, a monoform) is a step-like fold in rock strata consisting of a zone of steeper dip within an otherwise horizontal or gently-dipping sequence. Chevron folds are a structural feature characterized by repeated well behaved folded beds with straight limbs and sharp hinges. Well developed, these folds develop repeated set of v-shaped beds. They develop in response to regional or local compressive stress. Inter-limb angles are generally 60 degrees or less. Chevron folding preferentially occurs when the bedding regularly alternates between contrasting competences. Turbidites, characterized by alternating high-competence sandstones and low-competence shales, provide the typical geological setting for chevron folds to occurs. Perpetuation of the fold structure is not geometrically limited. Given a proper stratigraphy, chevrons can persist almost indefinitely. Typically monoclinal, result of differential compaction or dissolution during sedimentation and lithification. Folds are chaotic, random and disconnected. Typical of sedimentary slump folding, migmatites and decollement detachment zones. between the layers of the folded strata, which, altogether, result in deformation. A good analogy is bending a phone book, where volume preservation is accommodated by slip between the pages of the book. The fold formed by the compression of competent rock beds is called “flexure fold”.